At an intimate gathering in Austin on March 26, High End Systems national sales manager Craig Burross was presented an award from his peers and company founders for his achievement of $200,000,000 in sales of High End Systems' products. The Lifetime Achievement Award for $200m revenue is the culmination of Burross' seventeen years of sales leadership and contribution to High End Systems. In addition to High End Systems co-founders Lowell Fowler and Richard Belliveau, Vice-President of Worldwide Sales Renaat De Wilde, members of the HES sales team and other key employees were also in attendance for the evening's festivities. 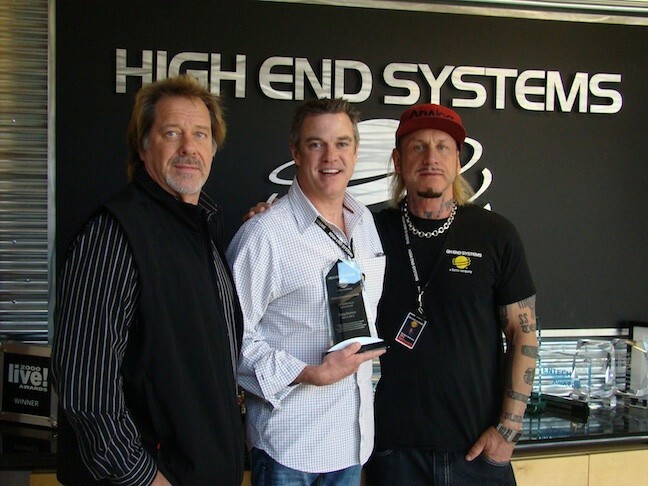 Craig joined High End Systems in March of 1991, and was instrumental in the company's sales of Intellabeam HX, Trackspot, Cyberlight, Studio Color and other revolutionary products in the midwestern US region. In picture: Lowell Fowler, Craig Burross and Richard Belliveau.